This article has the objective to show a study of different existing theories that consider the friction contribution of embedded piles in rock. It initially summarizes the adopted criteria for such theories and the coefficient ranges considered for the application of their basic expressions. The results of these theoretical analyses were applied in the solution of the foundations of a hotel, and its marine, built on the beach in the city of Varadero, Cuba. The study area presented a high geologic and engineering complexity, with highly variable stratification characteristics together with distinct soil and rock properties, where the presence of a calcareous stratum stands out in the deposit. The calcareous layer is found in a variable depth within the strata and has a quality ranging from very poor to good, where all the pile tips were founded. 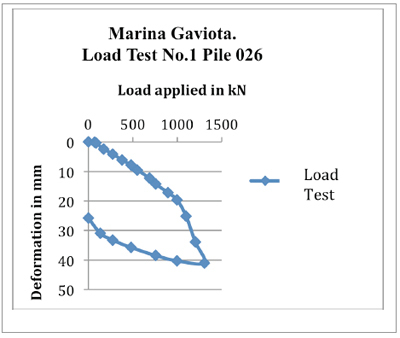 In order to obtain the bearing capacities from the designed piles, it was necessary to take into account their friction contribution within the rock, which was done by validating the existing theories through the execution of in situ pile load tests, combined with the use of theoretical models. This exercise allowed the establishment of practical coefficient values that were required by the theories in such particular site conditions. It was finally possible to yield design solutions for the deep foundations of this case history, which comprised over 2000 driven piles..
As known classical theories of Soil and Foundation Mechanics state, when a pile manages to become embedded in rock at least one time its diameter, that pile will work with support only at the tip and its friction contribution will not be taken into account, on the basis that the displacements at the tip of the pile will be negligible and thus pile-rock friction will not be generated. The above statement is true when the piles rest on high quality rocks. However, for cases where the piles are supported by low quality rocks, where they can be embedded in rock several times their diameter, the above statement is not true, and it is necessary to take the friction contribution within the rock into account when determining the ultimate bearing capacity of the pile. In this research, all these theories were studied, establishing basic expressions and intervals of the coefficients proposed therein. 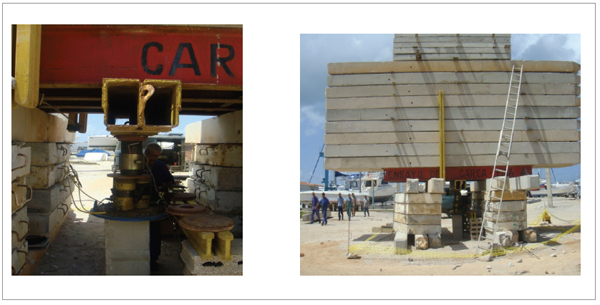 This study was necessary to apply to the solution of the foundations over piles in a hotel on the beach in Varadero, Cuba. The engineering geological conditions of the area were very complex and variable, together with the existing soil and rock properties. This can be simplified in a stratification consisting of a series of soft soils, with variable thickness of fill, peat, silt and other very loose soils, none of which contribute to the bearing capacity of the piles, and a stratum of calcarenite, which appears at different depths and with very variable quality, from good to very poor. There, the piles achieve embedded length (EL) from only 1.5 times its diameter to more than 14 times its diameter, depending on the quality of the rock. To determine the bearing capacity of piles, determinations for existing models, including the analyzed theories that consider the friction contribution within the rock where necessary, were combined with in situ pile load tests, which served to calibrate the models and set the interval at which coefficients taken into account in the conditions for the case study could vary. A very good engineering calibration of the models was achieved, and from it the resistant capabilities of the piles, for various conditions of support, were established. This allowed for a significant reduction in the length of piles, resulting in cost savings for construction. In order to characterize the engineering geological conditions of the study area, which was necessary for the determination of the bearing capacity of the piles, several in situ studies were carried out by the companies CeoCuba (2008) and ENIA (2010, 2011). This research included surveys, description of strata, geophysical studies, and laboratory studies in order to obtain the main physical and mechanical properties of soils and rocks. 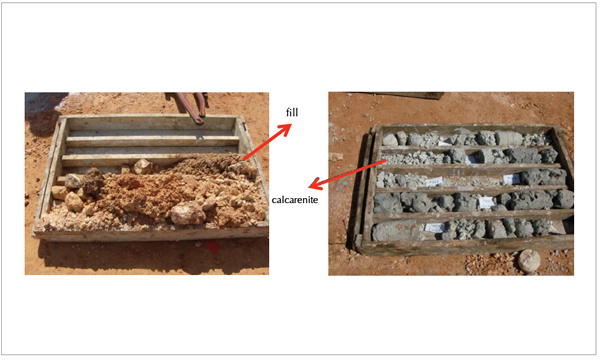 Figure 1 shows two photos of these soils during sample collection in the field, where the fill characteristics and especially the different qualities of calcarenite, with variable RQD values, can be observed. For the purposes of this study, stratification can be simplified to two zones, the first of which is composed of fill, peat, silt, and other loose soils that may or may not be present, which is formed by soft soils that do not contribute to the bearing capacity of piles. The second zone is composed of calcarenite, with different thickness and quality, which is what actually contributes to the tip and friction, accordingly. The tested piles were always embedded, with different EL embedded lengths, in calcarenite, with one of the above qualities. The result was when it was embedded in poor or very poor quality calcarenite, it was necessary to consider the contribution to friction, whereas when it was embedded in good quality calcarenite, only the contribution in the tip was taken into consideration. • Theories that consider the Tult as a linear function of the compressive strength of rock Rc. The general expression posed by this theory to obtain the ultimate friction resistance of pile in rock is defined by Formula 1. The general expression posed by this theory to obtain the ultimate friction resistance of pile in rock is defined by Formula 7. All previous theories can be expressed by Formula 7, considering the following variation intervals for variables k and α. 4. Determination of bearing capacity of piles. The procedure for determining the bearing capacity of piles, given the complexity of the study area, is set forth in Figure 2. 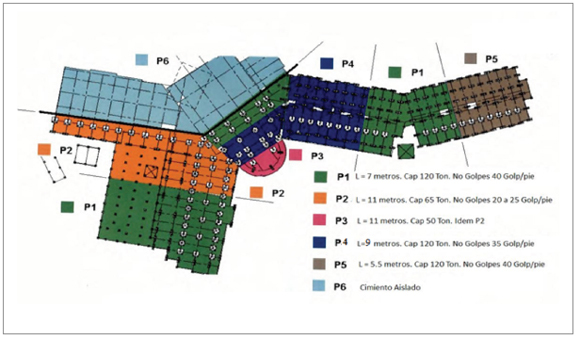 From the analysis of the results obtained from the first 5 steps of the methodology defined in Figure 2, it was determined that 8 in-situ load tests were needed for piles of different lengths and embedded with different EL embedded lengths, in calcarenite of different qualities. 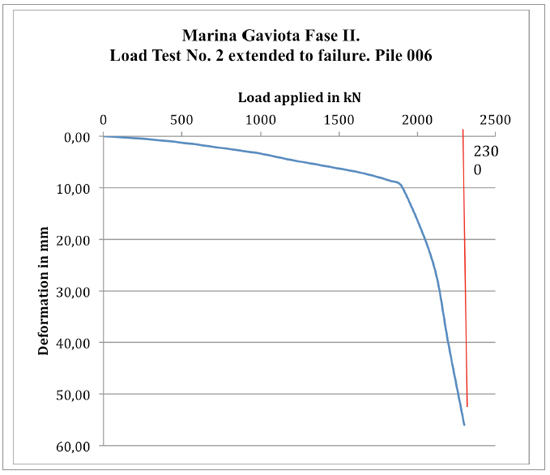 In this article we will discuss the results of 5 load tests: one of a pile embedded in very poor quality calcarenite, two of piles embedded in poor quality calcarenite, and two of a pile embedded in good quality calcarenite. The load tests were performed on individual piles, applying three load cells of 1000 kN capacity each, and placing a reaction pile above them, always greater than the load applied to the pile. 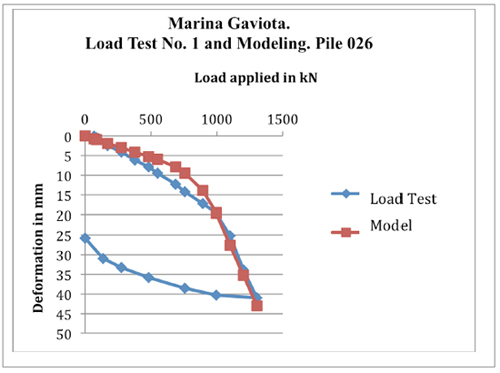 Figure 3 shows 2 photos of the characteristics of the load tests. Next we will show the results of two of the completed load tests, one with the pile embedded in poor quality calcarenite and the other embedded in good quality calcarenite. The first of these load tests was carried out on Pile 026, II m long, 9 m of which were driven, in a stratification whose Zone 1, composed of soft ground, with a capacity of 4 m, embedding of 5 m in the poor quality calcarenite. 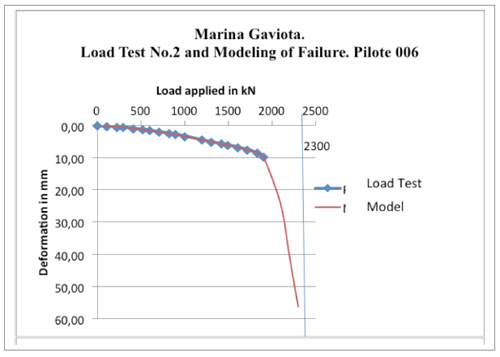 Figure 4 shows the results of the load deformation curve obtained from the load test. As shown in Figure 4, the pile failed with an ultimate load of 1305 kN and with a final deformation of 41 mm. After unloading, a yield stress of 25.8 mm was maintained, corroborating the occurred failure. The second load test was carried out on Pile 006, 9 m length, 7.2 m of which were driven, in a stratification whose Zone 1 had 6 m, embedding the pile 1.2 m in good quality rock. 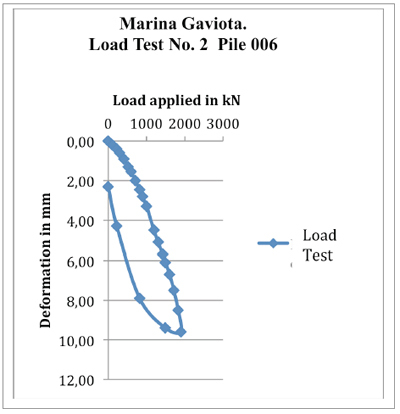 Figure 5 shows the results of the load deformation curve obtained from the load test. As shown in Figure 5, the pile was able to carry a load of up to 1902 kN, but for that load, it had almost a linear behavior, with a final deformation of less than 10 mm. After unloading, it had a yield stress of only 2 mm, which indicates that it did not reach failure. 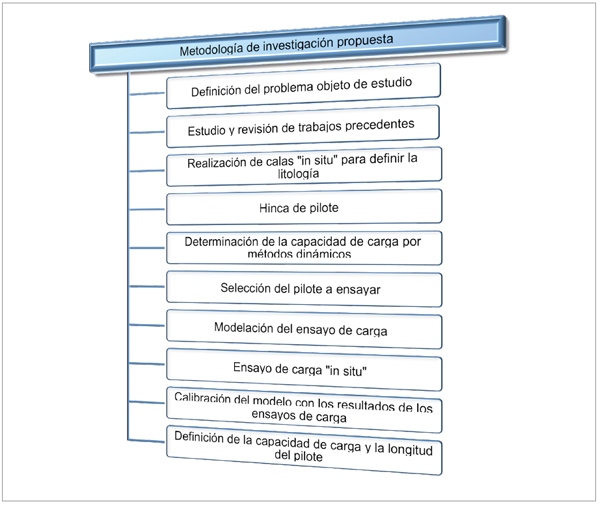 To obtain the ultimate load reaching failure on Pile 006, it was necessary to apply the graphic analytical method defined in the Proposed International Standard for the design of pile foundations (Ibanez, Quevedo 2011). The result was an estimated ultimate load capacity of 2300 kN, as shown in Figure 6. In the case of contribution at tip, formula 15 is applied, considering the contribution only when the pile is embedded in good quality rock. In the case that it is embedded in poor quality or very poor quality rock, the friction contribution within the rock will be considered. dr: factor that takes the EL embedded length of the pile in the rock into account, determined by formula (16). In the case of friction contribution in the rock (formula 17), everything analyzed in Section 3 of this article will be included when obtaining the Τult. Applying these expressions and determining the deformations of the pile foundations for the classic expressions for the same intervals of the load test, the theoretical models can be calibrated with the values of the load test, figures 7 and 8 show the results of such adjustments for the load tests on Pile 026 and Pile 006 respectively. As shown in Figures 7 and 8, the adjustments obtained between theoretical models and load tests were very good from an engineering standpoint. Table 1 shows the numerical results of adjusting the values of a for both methods considering the linear relationship with Rc and those that considered the quadratic relationship, for the determination of Qfvult. Table 2 shows the numerical results obtained in the determination of the contribution at the tip of all of the analyzed piles. Table 3 shows the numerical results obtained in determining the Qvult by theoretical models, considering the linear and quadratic methods when determining the Qfvult, and the values of the ultimate bearing capacity obtained from the load test Qvultpc. Table 3 shows the good calibration achieved between the Qvult values obtained from theoretical models and the Qvuitpc values obtained from load tests. In the case of piles 010, 026, and 037, where the friction contribution in the rock was considered, it was not possible to establish what method would be the best suited to the analyzed case: that which considers the linear function or that which considers the quadratic function. However, in general, both are very well suited to the cases. Table 4 shows the intervals of values of a obtained in the adjustments made when determining the Qfvult for both methods, as well as the intervals obtained from the analysis of international literature. As shown here, a intervals obtained in the investigation are among those mentioned in the literature, adjusting to their lower limits. Similarly, Table 5 summarizes the values of Qvtrab, the length of the piles, and the number of blows in the last foot that must be secured during the pile driving of each of the established zones. Table 5. Values of Qvtrab, length of piles and the number of blows in the last foot that must be secured during the pile driving of each of the established zones. The above results brought about a rationality in the solution of pile foundations for the analyzed building, with consequent cost savings. This allowed verification during pile driving that the obtained results were valid, having a very low loss of piles (less than 3%), with a behavior in each zone as established in the investigation. • A general methodology is established to address the solution of pile foundations in highly variable and complex geological engineering conditions, using a combination of correct characterization of the different existing stratifications, and the physical and mechanical properties of soils and rocks that compose them. Using theoretical methods of determining Qvult, where those that consider friction contribution in rock are included as well as dynamic formulas from the pile driving test results and in situ load tests, Qvult can be put as close to reality as possible. • Through studying the literature about methods for taking friction contribution in piles embedded in rock into account, it was concluded that there are two groups of methods. The first considers a linear relationship between Τult and Rc from the a coefficient, finding that this value, according to the different authors consulted, takes values in the range of 0.05 ≤ α≤ 0.4. The other considers a quadratic relationship between Τult and Rc from coefficient a, finding that the value, according to the different authors consulted, takes values in the range of 0. 1≤ α≤ 0.4. • From the results of the load tests, it was possible to calibrate the theories and coefficients used to consider friction contribution in the rock, so that for the methods that consider the linear relationship between Τult and Rc, the interval of variation a was 0.09 ≤ α ≤0.12, while for the methods that consider the quadratic relationship, the interval was 0.1 ≤ α ≤ 0.15, both being within those values defined in the literature, always tending to their lower values. • From determining Qfvult , including therein the friction contribution in the rock by the analyzed methods, and the Qpvult by classic methods, it was possible to obtain a satisfactory engineering adjustment between the load deformation curves obtained from load tests and those proposed by theoretical methods, demonstrating the validity of the latter. • With the application of the general methodology proposed in the solution of pile foundations of the analyzed building, the following was achieved: rational results for the foundation, proposed zoning depending on geological engineering characteristics, allowing to define the value of Qvtrab, the length of the piles, and the minimum number of blows needed to secure the last foot during pile driving for each of the zones. All of this was corroborated satisfactorily during pile driving.